Few trophies in Australian sport combine the history, provenance, the beauty and the scale of the Oxford and Cambridge Cup. This magnificently crafted trophy was donated in 1893 by Old Blues of the Universities of Oxford and Cambridge for competition between the men's eights of Australian Universities. The cup has been "back awarded" to 1888 -the year in which the intervarsity competition changed from men's fours to eights. The original university boat race was conducted over a "Thames Putney Mortlake" equivalent course, which varied between 2 miles and 3½ miles depending on location and conditions. This was changed in 1969 to the standard internationl distance of 2,000 metres. The trophy was organised by Dr Edmond Warre, Headmaster of Eton College and former President of the Oxford University Boat Club. He suggested to the Old Blues of Oxford and Cambridge that a trophy be donated for Inter-University Eight competition in order to foster a continuing interest in the young competition. In an 1890 letter to Frederick Halcomb (Captain of the Adelaide University Boat Club0 he states that “the idea was accepted by them with alacrity” and that they were “proud of the opportunity afforded them of showing their brotherhood, goodwill and interest in the welfare of their kinsmen in the antipodes”. The cup was sent out to Australia in time for the 1893 competition, where it was competed for and won by Melbourne. The cup features scenes in bas-relief of Oxford and Cambridge crews on one side and relief of colleges of Oxford and Cambridge on the other together with the floral emblems of the countries of England, Scotland and Wales. The Angel on the top is pictured in the traditional pose of the Toast to Rowing. This long-standing and traditional toast is afforded the winners of the Grand Challenge Cup. The trophy with base is on a grand scale - over a metre in height. Since 1888 the race has been run every year except during WWI and WWII and in 1965. There has been one dead heat - between Sydney and Melbourne in 1951 on the Huon River in Tasmania. Melbourne and Sydney lead the number of wins with Melbourne on 41 and a half and Sydney on 40 and a half. In recent years since 2000 Sydney has cut Melbourne's lead in the "number of wins" from 7 to 2 with Sydney having won 8 races of the 18 races since ( an including ) 2000. The magnificent new Women's Gold Cup - designed and made by sculptor Jennifer Mann. Presented to St Ignatius College for presenttion to the winning women;s eight at the annula Gold Cup Regatta. The 2015 Gold Cup Regatta will be remembered as a historic occasion. The day on which a new Women’s Gold Cup was presented to St Ignatius College for the Women’s Eights and a day on which the Women’s Eights (now only 6 years old at this regatta) would stand on equal footing with the men’s eights event. The new Riverview Women’s Challenge God Cup was manufactured by Melbourne sculptor Jennifer Mann and commissioned on behalf of approximately 35 donors by the leaders of this project and Rowing NSW. 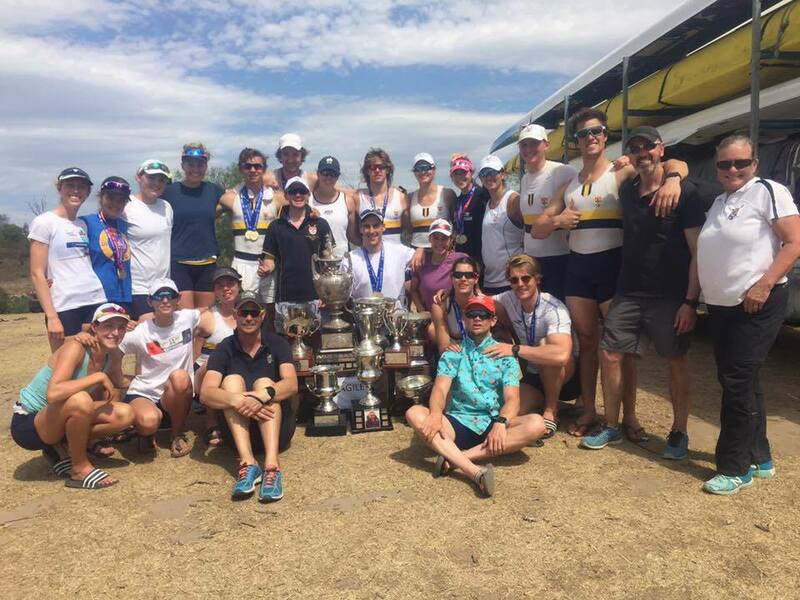 The project to create a trophy for the women's eight at the Gold Cup regatta was conceived at a meeting of the Gold Cup Regatta Committee in 2012 and was led by Chris Noel - a former President and Vice President of Sydney Uni Boat Club. Chris arranged the design and commissioned the trohy and solicited donations from across the New South Wales Rowing Community. The Headmaster of St Ignatius College presents the Women's Gold Cup for the first time at the 2015 Gold Cup Regatta. Mosman Rowing Club eight were the inaugural winners. The original Gold Cup for men's eights with the new Women's Gold Cup Trophy in the foreground. The 2008 King's Cup Race was a Classic Race and a Turning Point for New South Wales. After only winning two King's Cups in the 30 years since 1978, 2008 saw the first of a record (for NSW) seven wins in a row. Five SUBC rowers were in this crew that just beat Victoria and SUBC and Sydney Rowing Club stalwarts Chris Noel and Steve Handley were involved in overhauling and updating the selection and support processes for the NSW State crews. This year also saw the first King's and Queen's Cup Lunch held for our State crews. 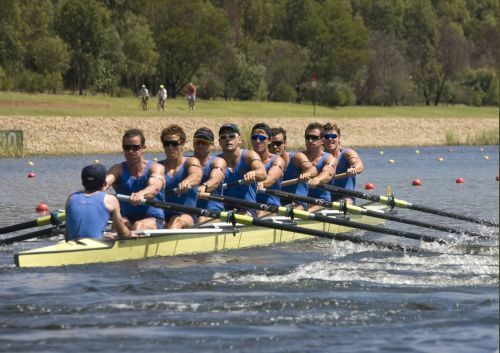 The 2008 National Regatta was marked by fantastic conditions and in the final race, the King's Cup, one of the most spectacular finishes in the recent history of interstate rowing. They say if you want victory or power you must grab it in a most uncompromising way - that is exactly what the Sky Blues of the NSW Men's Eight did today in the Kings Cup. A narrow, tenacious victory in a race where the three leading crews competed with passion, determination and a ruthlessness that brought the emotions of both competitors and supporters out in the open. The crew was boated with Athen's bronze medallist Steve Stewart changing sides to stroke on bowside and newcomer Terrence Alfred in the seven seat. Backing up in six was Stewart’s fellow UTS stalwart James Chapman and immediately behind in the engine room was NSW’s biggest gun, Tom Laurich from Mosman. In 4, 3 and 2 were Alfred’s fellow SUBC club mates – Fergus Pragnell, Francis Hegerty and Matt Ryan. The bow position was brilliantly handled by Sam Loch who returned to Australia in 2006 from Princeton and achieved selection this year in the Olympic eight. Fergus Pragnell and fellow crew members joked that with an athlete of Sam’s ability in the bow they had invented a “front wheel drive” boat. 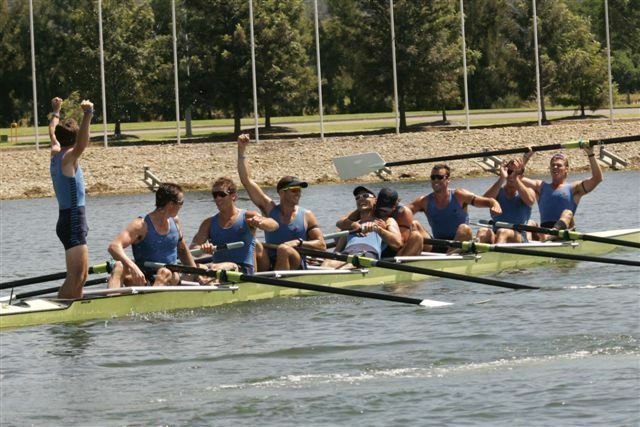 Although all members of the crew and reserve Nick Baxter were competing against each other for positions in the Australian Men’s Olympic Eight over the last 12 months they never lost connection with their desire to claim this prestigious trophy which has been rarely in NSW hands in the past twenty years. The draw which saw the most favoured crews NSW and Victoria in Lanes 1 and 6 , on opposite sides of the course, was always going to affect how the race was run but ultimately heightened the tension of an incredibly close finish. In the second 500 NSW cut 1.2 secs from the WA lead and the Victorians a little less. At the 1000 it was WA by 1.32 secs and Victoria only 0.4 behind NSW. At the 1500 it was still WA but just into the last 500 NSW made a dramatic move, sliced the lead quickly and shot ahead of WA with around 350 to go BUT the Victorians were also now swamping the former leaders. The Vics were now attacking and cox Rabjohns and stroke Stewart were covering their effort and holding an advantage of about 0.45 with only 250 to run to the bubble line. The crowd noise was drowning out the commentary and the NSW crew rose to the occasion, and despite some erratic movements in the boat’s course as the Vic’s applied the pressure, it looked like NSW may have just held on in a photo for first. A minute of tension for the crowd and then the announcement of the photo – NSW Kings Cup winners over Victoria by 0.21 with WA 3.14 back in third. The passion for this race was evident in the crew and the supporters of NSW and just as poignantly on the faces of the Victorian eight. It was obvious in the crowd as parents of the winning and losing athletes cried tears of joy, elation and sadness for their sons. For this correspondent one of the moments of memory will be being offered gracious congratulation for NSW's victory by the mother of one of Australia’s greatest ever rowers while the disappointment for her son was so evident on her face. The NSW crew wore black armbands to honour the memory of Francis Hegerty’s grandmother who passed away only two days before. To all members of the NSW Eight our club offers congratulations. To our club members of the winning boat for 2008 , Francis Hegerty, Matt Ryan, Fergus Pragnell and Terrence Alfred and cox Marty Rabjohns- well done and thanks for flying the colours of our State and club so high today. James Chapman (UTS) No 6: “We treated this race with seriousness it deserves from day one and it is all worth it now."